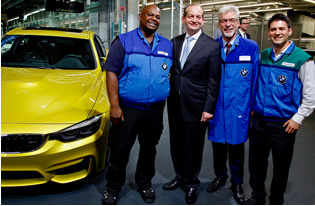 MUNICH – U.S. Secretary of Labor Alexander Acosta today visited the Munich headquarters and manufacturing plant of the BMW Group to tour the automotive company’s production and technical apprenticeship training facility. Secretary Acosta traveled to Germany to attend the G20 Labor and Employment Ministers’ Meeting, which begins in Bad Neuenahr on Thursday, May 18. Bunts, Carmin Rodriguez Valenti and Richard Young. The visit by Secretary Acosta builds on President Donald Trump’s initiative to strengthen the U.S. workforce and prepare more American workers to successfully meet the needs of the ever-evolving global economy. One keystone of the initiative is the expansion of apprenticeships in the United States. Apprenticeship programs have seen significant growth recently, as more employers recognize the programs’ success in attracting and retaining a top-tier workforce. The president discussed the German apprenticeship model with German Chancellor Angela Merkel, BMW Group CEO Harald Kruger and other industry leaders at a roundtable at the White House in March. The U.S. Department of Labor has established a number of strategic and international partnerships, including a Joint Declaration of Intent with Germany, to support sharing best practices on vocational education and apprenticeships. In 2014, German business investment in the U.S. market reached $224 billion, accounting for 7.7 percent of the total $2.9 trillion in foreign investments in the U.S. economy. This investment generates 600,000 U.S. jobs. Germany’s dual vocational training system is a public-private partnership that combines classroom learning with on-the-job experience to provide a foundation for a successful career. These competitive programs exist in many sectors, including manufacturing, information technology, transportation, financial services, and cybersecurity. BMW’s apprenticeship program is regarded as a successful example of the system. BMW AG Board of Management Chairman Harald Krüger welcomed Secretary Acosta and introduced him to all levels of the company, from members of BMW’s leadership to several young apprentices. The vocational training center Secretary Acosta visited in Munich is the largest training unit within the BMW Group and is currently training 870 apprentices in 16 different occupations. The company is also using the German dual vocational education model to train workers at its facility in Spartanburg, South Carolina, where approximately 9,000 workers are employed. “We greatly value Secretary Acosta’s visit as a sign of our company’s excellent, long-standing relationship with the U.S.,” said Krüger. “In training and education for manufacturing, we have a common denominator that we can leverage to increase the level of cooperation between our economies,” he added. In fiscal year 2016, the United States added 1,700 new registered apprenticeship programs nationwide, while more than 206,000 individuals entered the apprenticeship system nationally. Nearly nine out of 10 apprentices are employed after completing their programs, with an average starting wage of more than $60,000 per year. Over the course of their careers, apprentices earn over $300,000 more in wages and benefits than their peers. Through ApprenticeshipUSA, the Department of Labor has made critical investments to support the expansion of apprenticeship programs by states and industry partners. To learn more about the department’s efforts to expand and diversify apprenticeships, please visit https://www.dol.gov/featured/apprenticeship. Follow the Secretary’s G20 meetings on Flickr and on Twitter.